Michael Patrick McCarthy has been a veteran Sergeant with the Brownstown Township Police Department for more than a decade. He now has a mug shot from the Nevada Highway Patrol. This man of the law admits he was partying in Vegas on Super Bowl Sunday when witnesses say his SUV swerved across lanes and jumped a curb. According to the report, McCarthy's eyes were watery, glassy, bloodshot and his speech heavily slurred. His SUV reeked of alcohol. He admitted to downing six or seven beers. A one time failure in judgment? Maybe. But the 7 Investigators began digging into his past and what we found raises serious questions as to why McCarthy is still employed by the department in the first place. Court records show in 2006 McCarthy was accused of being drunk in an interrogation. 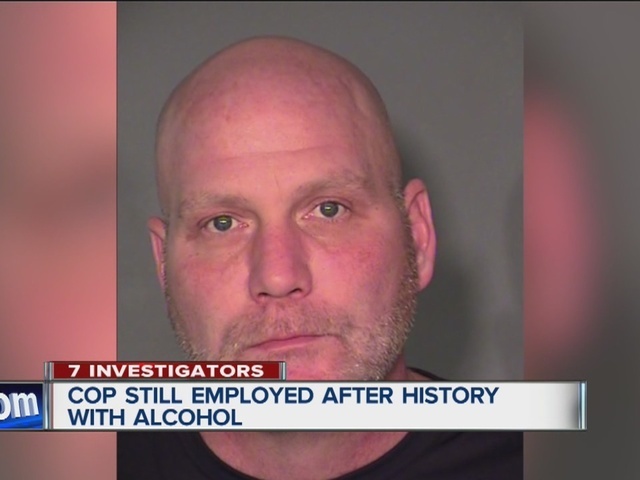 Then, later that same year, McCarthy was off duty when he was pulled over by fellow officers for driving erratically. One officer stated he almost killed him. McCarthy admitted drinking five to ten beers. The officers at the scene didn't conduct a sobriety test. Instead, a supervisor drove McCarthy home without issuing a citation. McCarthy was referred to an alcohol counselor, but failed to meet him - according to reports. The officers involved complained they were forced to give special treatment and wanted McCarthy brought up on charges. Township leaders reluctantly sent the case to MSP for investigation, but due to a lack of evidence and time passed, nothing was done. McCarthy was never punished. You'd think McCarthy would let it lie. But he filed a lawsuit against the township claiming he was defamed by the officers. That was later thrown out. But through all this McCarthy continued to be promoted and employed. That was the decision of township attorneys, says the township supervisor. Seeking accountability we visited the township attorney and was told "no comment". Following his February arrest McCarthy was placed on leave. But not fired. The township says it is waiting to see the outcome of his recent charges. But should someone with his history be carrying a gun and badge, regardless? We wanted to get his boss's opinion, Public Safety Director James Sclater - a longtime department leader, familiar with McCarthy's past, who has enabled his employment and a salary paid by you the taxpayer. He wouldn't return dozens of phone calls and emails, so we showed up at the department. We were told he was on vacation. Finally, we decided to pay McCarthy a visit. We went to the home address he gave Nevada officers. Turns out he doesn't live there. But he couldn't hide from the 7 Investigators. We tracked him to an apartment building a few blocks from the police station. "I got no comment," McCarthy said when he opened the door to his apartment building, smirking and visibly surprised by our visit. He is due back in a Las Vegas courtroom soon.